We welcome you to come out and see two of Smith Douglas Homes’ top selling communities: Whitfield at Flowers Plantation and Knolls at the Neuse! Nestled within two well-established communities, Whitfield and Knolls at the Neuse offer a variety of home options, perfect for every family! Whitfield is located within the highly sought-after master-planned community Flowers Plantation and offers a selection of ranch and two-story home plans. Enjoy low-maintenance living with included lawn service and optional memberships to the Club at Flowers Plantation Spa and Fitness Center. Homes are priced low to sell, starting in the high-$100’s and offer spacious living areas and downstairs master options. For more information, contact Anna Ballan at Whitfield@SmithDouglas.com or 919-441-3107. Knolls at the Neuse is conveniently located near the Neuse River and offers peaceful, suburban living for families. Come view one move-in-ready home, our top selling Avery plan, and several homes currently under construction. Knolls at the Neuse provides home plans with plenty of room to spread out, including basement lots, on large homesites. Prices start in the high-$200’s. 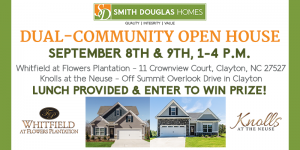 For more information, contact Kelly Norris at Knolls@SmithDouglas.com or 919-441-3500. These communities are conveniently located near NC-70 in Clayton, close to shopping and restaurants. Join us this Saturday and Sunday (September 8th and 9th) from 1 p.m. to 4 p.m. Lunch and light refreshments will be provided. We invite you to start in Whitfield (11 Crownview Court, Clayton, NC 27527) and finish your tour in Knolls at the Neuse (use GPS Address Summit Overlook Drive in Clayton and follow the signs to our community).